If your plant uses steam, hot water or hot oil for process heating and VOC abatement is a requirement, then Ship and Shore Environmental can help. We have designed a unique system that incorporates a thermal oxidizer and waste heat boiler into one unit, which can save you money and make your operation more efficient. 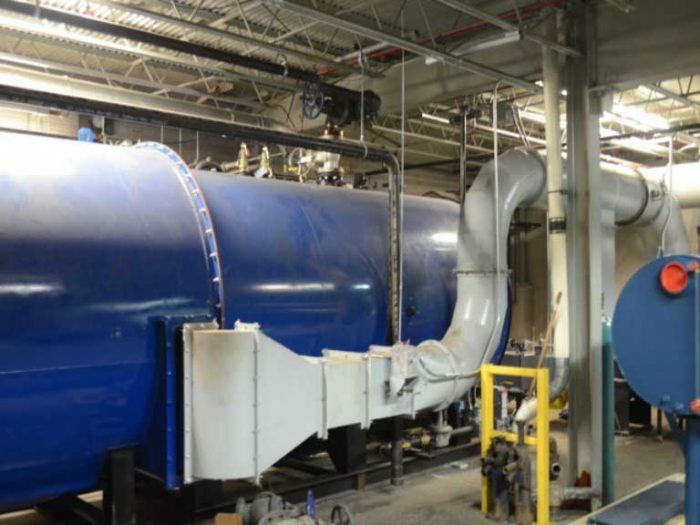 Ship and Shore Environmental offers a Steam Generating Thermal Oxidizer (SGTO) that is customized to meet your plant’s specific application needs. This system is designed to be used in environments where the plant can consume all of the steam that the unit produces. Another operating boiler supplies the remainder of the steam load, by modulation of its burner. Although it has the appearance of a boiler, it can process large air flows due to the unique design and construction of the burner package. Typically, when a conventional boiler is used, the maximum air flow through the unit is dictated by the maximum combustion air supply required for the burner. This is a function of the heat released by the fuel that is controlled and modulated with steam demand. With the Ship and Shore Steam Generating Thermal Oxidizer, fuel requirements are dependent upon the heat content of the VOC’s in the air stream, as well as its’ temperature and volumetric flow rate. In some cases, a secondary heat exchanger may be utilized to preheat the VOC laden air with the waste energy in the boiler exhaust, resulting in a significant reduction in consumption of support fuel. In some systems, the remaining energy in the boiler exhaust stream is recovered by the installation of an economizer for boiler feed water heating. The remaining waste energy in the boiler exhaust can also be used for space heating, or as an energy source for a hot room or oven, by installation of a clean air heat exchanger.